Sister Ludovica’s message to me was that NASA’s Jet Propulsion Laboratory had just issued a worldwide alert through its Sentry Earth Impact Monitoring system notifying every telescope in the world to immediately begin monitoring a mysterious object that had entered our solar system from interstellar space, and that had come from the direction of the star Vega, in the Constellation Lyra. First detected by Pan-STARRS telescopes in Hawaii, they first designated this mysterious object as being Comet C/2017 U1, but because it showed no presence whatsoever of any cometary nature., the International Astronomical Union’s Minor Planetary Center then renamed it to Asteroid A/2017 U1—thus making it the first comet to ever be re-designated as an asteroid. Not just were Dr. Chodas and the world’s entire astronomical community intrigued by the appearance of this mysterious object, but so was Pope Francis—who was able to secure a classified communication link with the International Space Station, whose scientists were using their HyperStar Lens equipped onboard telescope to view A/2017 U1—with the Pope ending his “visit” by asking the astronauts there to “report back on man’s place in the universe”. At the same time I was contemplating about this mysterious space object, and its historical-mythological significance, more stunning information was released in the media this week stating that the world’s top scientists had come to the conclusion that our universe shouldn’t exist at all—all of whom have struggled for decades to explain why our cosmos didn’t destroy itself as soon as it came into existence as that’s what all of their calculations and experiments showed should have happened. And as everything seems to come in “three’s”, while contemplating this mysterious space object, and the universe we live in not existing, then came this past week a new scientific research paper revealing that a “mysterious” modification to DNA had been observed occurring in mice under stress—which scientists for decades had said was absolutely impossible as DNA could never be changed by ones lifestyles, and their saying that anyone who claimed otherwise is “a public disservice”. To a world seeking true knowledge on how to place all of these stunning revelations into their proper context, I became disheartened for them this past week, too, especially after reading stories from America showing that within that nation’s highest academic circles, the very pillars of thought and learning are being destroyed—with University of Illinois professor Rochelle Gutierrez now claiming that math, algebra and geometry promote “white privilege” and should be stopped from being taught, and University of California professor Sara Giordano calling for “traditional science” to be immediately replaced with an “anti-science, anti-racist, feminist approach”. Now, and of course, I can tell you much about the greatest significance to this mysterious space object—particularly as it comes from the star Vega that the ancient Assyrians called the “Judge of Heaven”, the Babylonians named “The Messenger of Light”, and has been worshiped for centuries by cultures the world over—and whose orbit is a near mirror match of the equally mysterious “Planet Nine” that NASA, just last week, highlighted five lines of evidence pointing to its existence with their saying that “imagining Planet Nine does not exist generates more problems than it solves”. To tell you about the greater significance of scientists now claiming that our universe shouldn’t exist at all is simple too—and that my Dear Sisters began to touch upon this past week in their writing their report about God being real—and therein explained how quantum scientists have come full circle around to what the Bible said was true from the very beginning—“everything begins with light”. 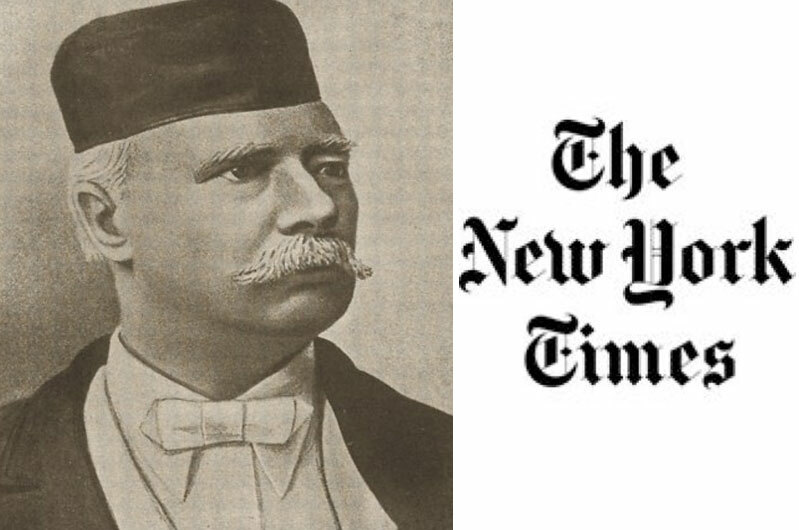 And to the “new” discovery that DNA can be changed by stress, that we’ve also long told you about—and as the Sorcha Faal documents by guiding you to the research of Russian biophysicist and molecular biologist Pjotr Garjajev who, for decades now, has proved how even words can change ones DNA. Most sadly though, anything I tell the majority of you about these things will not be “heard”—and is entirely due to your elite leader class deeming you unworthy of knowing the truth, and who fully know that by making you believe what they tell you, it leaves you with no control over your own life,–and is the most important first step to their creating you into an obedient totalitarian subject—and that in America, the FBI has refined into one of the most insidious mass brainwashing experiments the world has ever seen—and who laughingly touted in their once secret documents: “Nielsen data indicates that FBI-themed dramas or documentaries reach 100,000,000+ people in the United States”. Now as the masses of you have been brainwashed to believe that we are the “fools” the FBI warns they must be protected from, let me ask you a question—what is the very least amount of time one could expect of the FBI to investigate the assassination of an American president? If your answer is less than 48 hours you’d be correct! 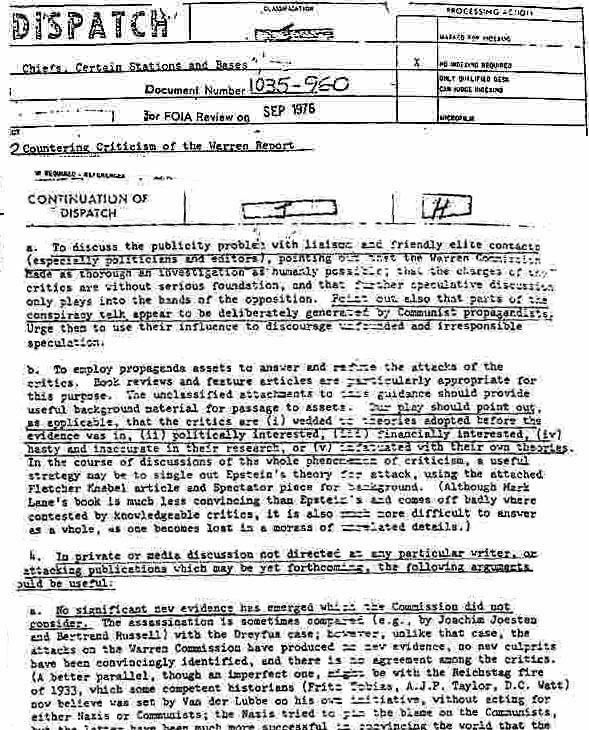 And as proved was all the time the FBI devoted to investigating the 22 November 1963 assassination of President John F. Kennedy, with FBI Director J. Edgar Hoover himself sending a message to his agents in Dallas, Texas, instructing them, on 24 November 1963, to rush to the bedside of the dying Lee Harvey Oswald in order “to have something issued so that we can convince the public that Oswald is the real assassin”. 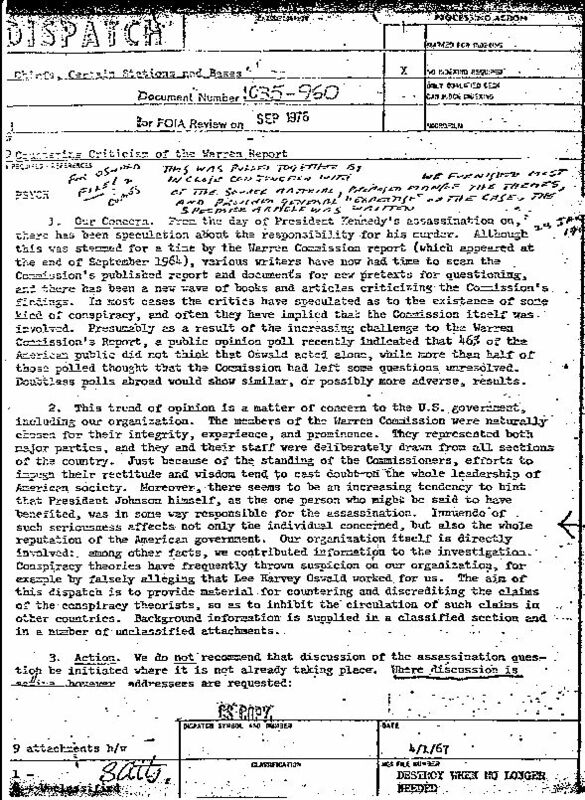 You should know, too, that the FBI isn’t alone in using mass brainwashing tactics either, as the CIA, in 1967, gave to all of their US mainstream media outlets the “instructions” they were ordered to use against anyone attempting to tell the real truth about what happened—and included their calling them “conspiracy theorists” and then “accusing them of having a financial interest in promoting their conspiracy theories”. Unlike the FBI, CIA or its media counterparts NBC, CNN, CBS, BBC, etc, we do not believing in brainwashing you at all—as we firmly believe that everything needs to be examined to its fullest, and most logical, conclusion in order for the truth to be known. Mere “words” are not facts of anything, and anyone telling you to believe theirs, and not to believe those of others, is the very definition of arrogant hubris—and leads to such insane circumstances like is exampled by President Donald Trump being blamed for “colluding with Russia” to rig the election against Clinton because “they say so”—while at the exact same time, all of the facts and evidence prove that Hillary Clinton colluded with Russia to rig the election against Trump. Likewise, and as many of you already know, throughout the entire of 2016 US presidential election, we were one of the very few “voices in the wilderness” telling you that Trump was going to win—and that we knew was true because we examined the facts and evidence proving it was going to be so—and told YOU about too! Yet even as you know these truths about us, the majority of you will turn away from our pleas for help—and that we ONLY make in order to keep you as informed and educated as possible. And believe me when I tell YOU—there is absolutely no “profit” to be made in doing this either—and that goes even more for the mainstream propaganda media whose failings, mass layoffs and closings are too numerous to count—and is why you now see billionaire leftist-elitists like Michael W. Ferro Jr. Jeff Bezos and Laurene Powell Jobs (the widow of former Apple Inc. chairman and CEO Steve Jobs) becoming the new “media barons” of America you never hear about. Your choice now is if you’re going to awaken and begin to support us, and those like us, who continue to tell you the truth—or if you’re going to continue supporting those leftist-elitist “powers” who want nothing more than your destruction—after all, that’s what you do with “deplorable” and “racist” people, isn’t it? Just a pittance of $20.00 from each of you reading these words would keep us alive for a whole year, as we always say—so please help us help you—after all, aren’t WE all in this together?